Remote cooler ctrl & perform mgt. At the center of the evaporative cooling process and the Earth's climate moderating processes used by Mother Nature is water. From a weather and climate perspective, the existence of water in its three physical states (ice, liquid water, and water vapor), the behavior of water vapor as a perfect gas, and waters high characteristic values of thermal conductance, specific heat, and latent heat of vaporization are the reason that it is a major driver in determining and mediating the observed temperatures, barometric pressures, and wind currents throughout the globe. From an evaporative cooling perspective it is the evaporation of water that cools the outside air as it passes through the cooler media to provide conditioned air for improved equipment reliability and human comfort and productivity in hot climates. The objective of this web page is not to provide a comprehensive discussion of the scientific laws and engineering principals that govern the design, operation, and performance of evaporative coolers. Rather, the objective is to provide a focused overview with additional detail on the more pertinent laws and principles that drive cooler performance and are behind the significant improvements delivered by AZFlow coolers. To this end we present information on Psychrometry, Heat Transfer and Fluid Flow, Salt Scale Formation, and Corrosion. Evaporative cooler design and performance is driven by the thermodynamic behavior of moist air. Psychrometry which is the field of science dealing with the properties and thermodynamic behavior of moist air is therefore at the foundation of evaporative cooler design and performance. The following psychrometry principals and laws underlie the moist air properties and thermodynamic behaviors. Air, water vapor, and the mixture of air and water vapor behave consistent with the ideal gas equation of state. This equation is PV=RT where PV represents the product of the variables P (pressure) and V (volume) which is equal to R (a universal constant) times T (the absolute temperature of the mixture). The evaporative cooling process as with other processes must satisfy the law of Conservation of Energy. This law states that energy cannot be created or destroyed only changed in form such that the starting energy and ending energy must be equal. The evaporative cooling process as other cooling processes must also satisfy the law of Conservation of mass. This law states that the combined mass of dry air and water must be the same at the start and end. This means that if water with a certain mass is evaporated this same mass must show up as water vapor. Dalton's law of partial pressures applies to evaporative cooling and other cooling processes. This law states that in a mixture of different ideal gases that occupy the same volume and share the same temperature, the pressure of the mixture is equal to the sum of the pressures of the component gases. The Gibbs-Dalton law for the energy of a mixture applies to evaporative cooling and other cooling processes. This law states that the energy of the mixture (enthalpy and entropy) is equal to the sum of the energy (enthalpy and entropy) of the individual components making up the mixture. The following are key characterization properties for moist air that are used in the design, evaluation, and operation of evaporative cooling and other cooling processes. Dry-bulb temperature this is the temperature of air indicated by an ordinary thermometer. The dry-bulb temperature of a space is the primary indicator of how warm or cool our body will consider a space. The dry-bulb temperature at various points along a cooling process provides important design and operational information regarding the sensible energy content. In particular, the inlet, outlet, and average room dry-bulb temperature provides a critical picture of cooling effectiveness. Wet-bulb temperature this is the temperature of air measured by a sensor covered with a water-saturated wick with air moved over the wick at approximately 900 ft/min. The wet-bulb temperature provides important information when designing or operating cooling, humidification, and dehumidification equipment, particularly evaporative coolers as this provides the lower limit (100% efficient) of cooling that can be achieved with direct evaporative coolers. Wet-bulb temperature can be calculated given the dry-bulb temperature, relative humidity, and barometric pressure. Relative humidity this is the ratio of the mole fraction of water vapor present to the mole fraction of water vapor for saturated conditions at a specific dry bulb temperature and barometric pressure. Dew-point temperature this is the temperature at which water vapor has reached the saturation point where water starts to condense. Dew-point temperature will tend to change with general weather patterns but be constant over the course of a day. When the Dew-point temperature is greater than 55 for three days in a row we are officially in the monsoon season. Specific volume this is the reciprocal of density or the volume of moist air per unit mass of the dry-air component of air. Since moist air follows the ideal gas equation of state, the mass of air in a specific volume is dependent on the universal gas constant, the temperature, and the barometric pressure. This parameter is important in evaporative cooling since it characterizes the mass and volume flow rate through the coolers. Specific enthalpy this is the energy per unit mass of the dry-air component of air. Evaporative cooling is an adiabatic process where the enthalpy of the air does not change as the dry-bulb is lowered with the evaporation of water and addition of water vapor to the air. What changes is the form of the energy or enthalpy. Namely, as the air is cooled by evaporating water the energy distribution per pound of dry air shifts from sensible energy to latent energy. Barometric or total pressure this is the sum of the partial pressures of dry air and water vapor read with a barometer at a specific location. Water vapor partial pressure this is the portion of the total mixed air pressure attributable to water vapor. Dry air partial pressure this is the portion of the total mixed air pressure attributable to dry air. Fluid dynamic behavior of air and water in an evaporative cooler has a significant impact on the performance of evaporative coolers. Namely, having a uniform distribution of the proper proportions of air and water throughout the media to satisfy the thermodynamic requirements of the cooling process is critical to achieving the highest levels of performance. The following principles and laws govern the behavior and properties of fluids in motion and therefore the ability to distribute the water and air uniformly and in the desired proportions. Bernoulli theorem which states that the total energy at any particular point above some arbitrary horizontal datum plane is equal to the sum of the elevation head, the pressure (static) head, and the velocity (dynamic) head. Darcy's general equation for flow of fluids including the effects of friction which states that head loss is equal to an experimentally derived friction factor times the length of duct times the square of the velocity divided by the diameter of the duct divided by two times the acceleration of gravity. In most of the US the water from rivers, lakes, and wells is classified as "Hard" to "Very Hard". Water hardness is a measure of the mineral content of water. The simplest way to determine if water is hard or soft is to use soap and attempt to create lather. Soft water lathers much more readily than hard water. Hard water typically contains high levels of metal ions in the form of dissolved calcium (Ca) and magnesium (Mg) carbonate salts. While these salts are usually the dominant constituents, several other metals may be present and bicarbonate and sulfate salt forms may be present. The common source of these minerals is Mother Earth as it undergoes weathering and erosion processes. In particular, the weathering / erosion of limestone CaCO3 and silicate CaSiO3 rich land mass. This activity is part of the Earth's Carbon Cycle with the atmosphere, biosphere, and oceans serving as mobile reservoirs and the rock mass acting as long term reservoir where most of the Carbon resides. From the perspective of designing and operating an evaporative cooler, the hardness of the water is important since it is a critical factor that drives the rate of scale production. This scale formation is an important concern since the existence of scale on evaporative cooler media results in reduced heat transfer and therefore non reversible reduction in cooler performance. The following factors govern scale formation during the evaporation of water and therefore play an important role in the evaporative cooling process. Cycles of concentration - As water evaporates all the minerals, salts, and suspended solids that were originally in the water are left behind with pure water becoming water vapor. The ratio of the volume of water that started the process divided by the volume of water that remains after evaporation is termed "cycles of concentration". As an example if an evaporation process starts with ten gallons of water, evaporates nine, and leaves one gallon behind, it would be characterized as a 10 cycle of concentration process. Bleed is the term used for water that is discharged from the cooling cycle to limit the buildup of minerals. A non recirculating evaporative cooling process would be running at 10 cycles of concentration if the feed is 10 gpm, evaporation is 9 gpm, and the bleed is 1 gpm. This characteristic of the process clearly establishes a measure to compare the effective water usage of various evaporative cooling processes. Cycles of concentration in a recirculating system is a little more complex since the water bleed stream is not just the concentrate but includes some of the water added as feed. Scaling index - Scaling index is an experimentally derived value that is used to predict the likelihood that scale will form given the chemical characteristics of a water solution. In particular, Langelier, Ryznar, and Puckorius (Practical Scaling Index) are names of the more prominent scaling indexes used to characterize this propensity of water with concentrated calcium carbonate to precipitate and form a scale. These scaling indexes typically use the pH (acidity - alkalinity measure), hardness, total dissolved solids, and carbonate concentrations to predict the likelihood of scale formation. As air that is below its saturation conditions (< 100% relative humidity) passes over a source of water, the water evaporates. When water evaporates it changes state from liquid to vapor; these two physical states of water exist at different internal energy levels while the sensible temperature and pressure remain the same; this difference in internal energy is called the latent heat of vaporization. The actual value for the latent heat of vaporization varies as the pressure varies (decreases with increasing pressure). A significant characteristic of water is that this latent heat of vaporization throughout its full range is the highest of any earthly substance (approximately 1050 BTU/lb at 75° F and sea level). As water evaporates, energy is drawn from the surrounding air and water. If there is no external source of energy to replace the energy that is used to evaporate the water, the energy of the surrounding air and water are reduced (the temperatures are reduced). The energy can only flow from a higher energy state to a lower energy state. Therefore, there is a limit to the level of cooling that can take place. The limit for direct evaporative cooling is that the dry bulb temperature leaving the cooler can not be less that the wet bulb temperature of the air entering the cooler. The temperature of the water that exits the cooler is also limited to this wet bulb temperature. 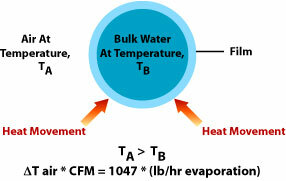 Within this limit, cooling takes place as energy is drawn out of the air at a rate of one BTU for every pound of dry air that is cooled 4.7° F and one BTU for every pound of water that is cooled 1° F.
As a rough example of the order of magnitude of the cooling effectiveness of this process we can assume a case where all energy comes from the surrounding air to cool it. If we further assume that we evaporate 1 pound of water (0.12 gallons) we would cool about 262 pounds (3550 cubic feet) of air 18.8° F.
Psychrometric charts are one of the most widely used graphical devices of the refrigerating and air conditioning industry. Their principle purpose is to graphically portray the relation between the major properties of moist air: dry-bulb temperature, wet-bulb temperature, dew point temperature, humidity ratio, enthalpy, and specific volume. This graphical characterization provides a short cut process to predict and analyze the performance of HVAC cooling systems. In particular, armed with this chart one can locate the point that represents current or design cooler inlet conditions and predict the output conditions for various cooler operations. For example, heating or cooling without adding or removing moisture (the heat exchanger in an indirect cooling cycle) will follow the constant moisture or constant humidity ratio line, and direct cycle evaporative cooling follows the wet bulb temperature line.